Advertising on Fruitnet puts your company in front of tens of thousands of key decision-makers in the global fresh produce business. For more details, please download the Fruitnet advertising brochure. Fruitnet publications also organise fresh produce conference events all over the world – the best way to explore commercial opportunities and make new business contacts. The group’s annual events now include Asiafruit Congress, Global Berry Congress, Fresh Produce India, Fruitnet Forum South-East Europe, Fresh Produce Forum China, Fruitnet Forum Middle East, FPJ Live and DOGK. 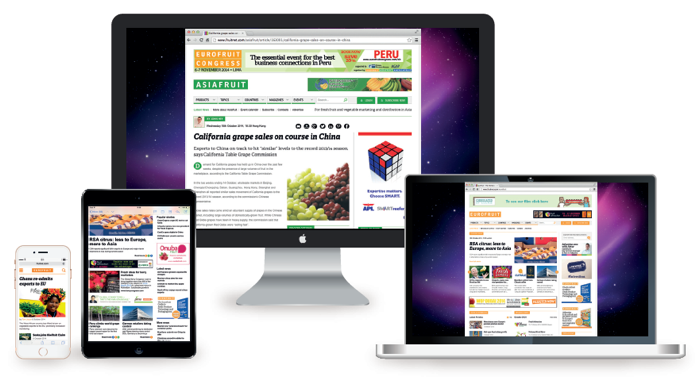 The Fruitnet Media International Group comprises Eurofruit, Asiafruit, Americafruit, Fresh Produce Journal, Produce Plus and Fruchthandel Magazine.